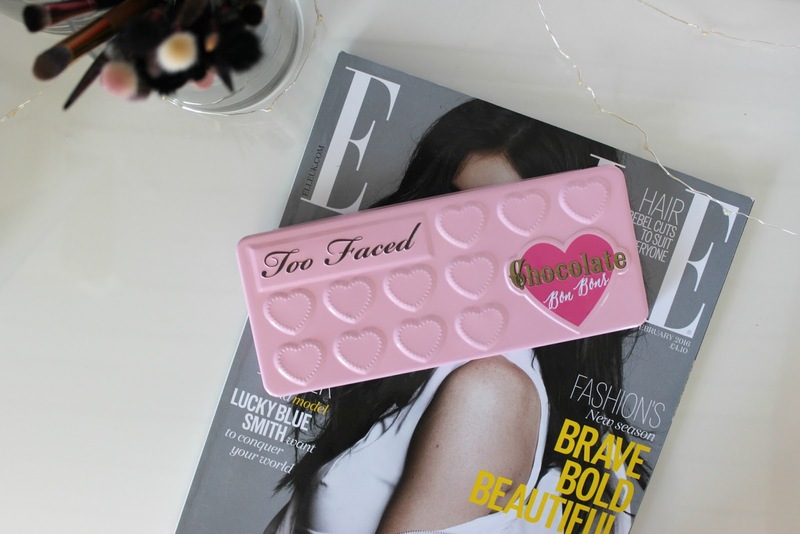 With all the hype around the new Sweet Peach palette, I thought I'd review another of the Too Faced palettes, one that is actually available to purchase. 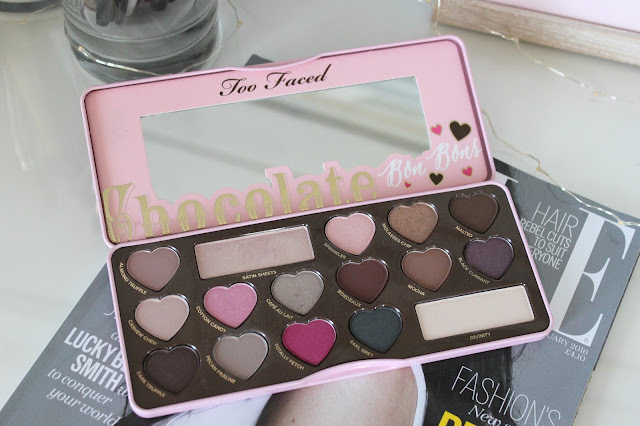 I'm talking about the Too Faced Chocolate BonBons palette. This was the first "chocolate bar" palette I purchased (and the only one to date), and I realized as I was going through old blog posts today that I had yet to talk about it. Keep reading to find out my thoughts, after months of playing around with it! When I bought this palette, I was only wearing cool toned eyeshadows. Thankfully, I've once again expanded my horizons and am more adventurous with my eyeshadow looks. That was why I had never purchased any of the other chocolate bar palettes. They were either on the neutral-warm side, or very warm (in the case of the semi-sweet palette). 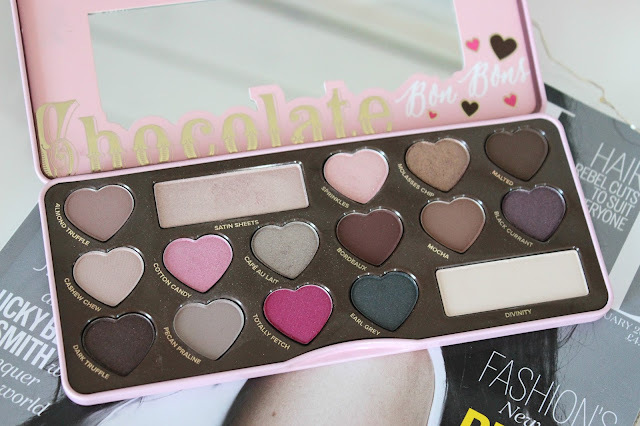 The BonBons palette is very cool toned, with a lot of taupes and greys as transition colours. What I think I love most about this palette is that it seems so unique. 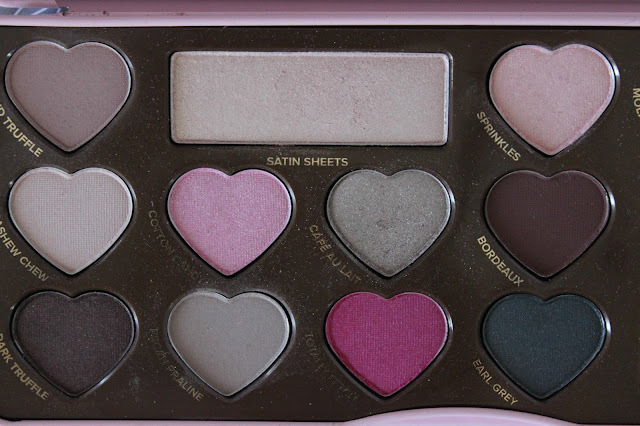 I find that most eyeshadow palettes are either very warm toned, or are filled to the brim with pinks and purples (even blues) to create that cooler effect. 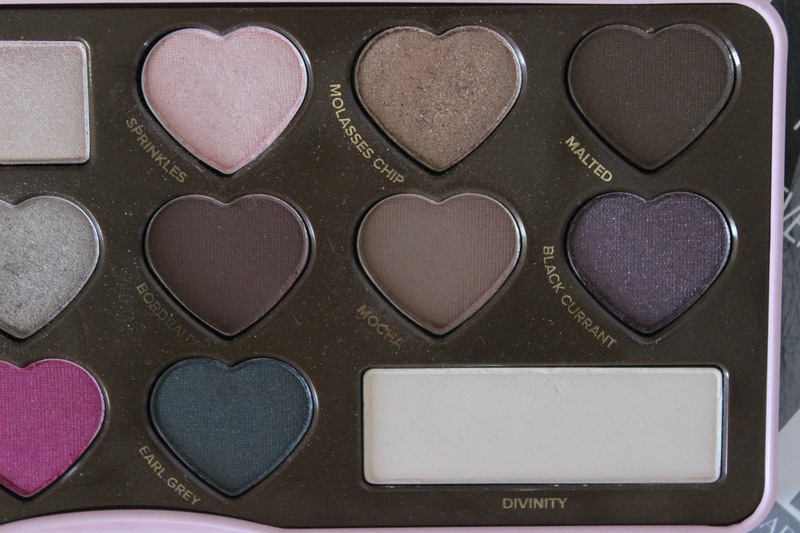 Whereas this palette still has all the browns and neutral colours you need, without all the crazy colours. That being said, there are still a lot of pinks (a colour that I love to wear on the eyes), and one purple and blue. With these subtle accents, it makes the palette more wearable and less intimidating, and I think that's why I reach for it so much. You can create anything from a super simple everyday look, with something like Satin Sheets all over the lid and a bit of Almond Truffle through the crease. You can create a more whimsical look with Cotton Candy and Sprinkles, or go all out with Totally Fetch or Early Grey. With this palette, the possibilities are endless. As for the quality, I'd say they are on par with other Too Faced eyeshadows. I know some people complain that the pigmentation isn't as great as the other Chocolate Bar palettes (which I can't attest to), but I haven't had a problem with the colours here. I think they are a bit on the subtle side, but I personally find this makes them easier to blend, and you are less likely to go overboard. There isn't a single colour I wish wasn't in this palette, nor are there any colours I wish were here, but are not. Overall, I think this is an amazing palette for anyone who loves cooler toned eyeshadows (you should of played a drinking game with this post; take a shot every time Katherine writes "cool toned").